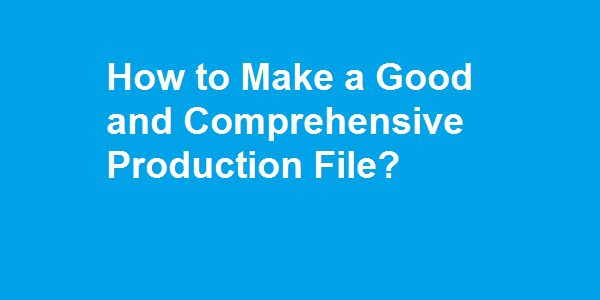 How to Make a Good and Comprehensive Production File? In apparel export manufacturing merchandiser communicates with buyers starting from product development to shipment of the finished goods. Whatever information merchant receives from buyer related to production style, she communicates it to production team. Most of the organized factories follow a standard procedure for the communication in between merchandising to production department. Production file is such one example. Merchants are responsible for making production file. A standard production file contains following items. Approved fabric swatches of all color ways. If there is any shade band it is also mentioned what lots are accepted and what are not accepted. If there is contrast color combination it is mentioned in the file. Post sewing processing details (washing, dry cleaning or dying) to be mentioned with final look. Other specific information those are very important for the style quality – needle size to be used. Ex-factory date – at what date shipment to be ready for final inspection and to be ready for the move to the port. Issue a ring binder or paper spring file from stationary department (store). Take print out of all buyer documents (tech pack, specification sheet, comments, production order and important mail communications) and staple category wise. Issue few swatch cards (little bit thicker paper) and make trim card. Staple trims on the trim card. Or you can put trims inside small poly pouch and staple the pouch on the trim card. Sign on the trims as your approval. If you have approved strike offs for printing and embroidery or handwork, staple those approval on the swatch card. Punch all documents and swatch cards with punching machine and file them in the ring binder (production file) in a sequence of above list. Prepare a check list with above and fix it on the inside front cover. In the check sheet mention what is approved, what is awaiting for approval, what are pending to hand over etc. Label the file with Style/Order Name, Buyer Name, Merchants name, File hand over date, planned cut date and Ex-factory date. Online Clothing Study: How to Make a Good and Comprehensive Production File? Procedure of making the production file in apparel production.